Export the entire contacts database from our contact management software to a mailing list in Campaign Monitor. Campaign Monitor makes it easy to send beautiful email newsletters and see stunning reports on the results. ClinchPad is a sales management software for small businesses helping them clinch more deals faster. Keep your mailing list up to date using ClinchPad's integration with Campaign Monitor. ClinchPad is a dependable contact management system. By assisting our users to store unlimited contact information securely in the cloud, we ensure that they don't have to pay for a business contact manager separately. It comes with all the goodies that you need to track sales leads - bulk import from CSV files, Google Contacts Sync, fine grained access control and more. It's the duty of a great contact management software to sync and share information with other business software. The goal of our integration with Campaign Monitor is to assist you in running successful email marketing campaigns. 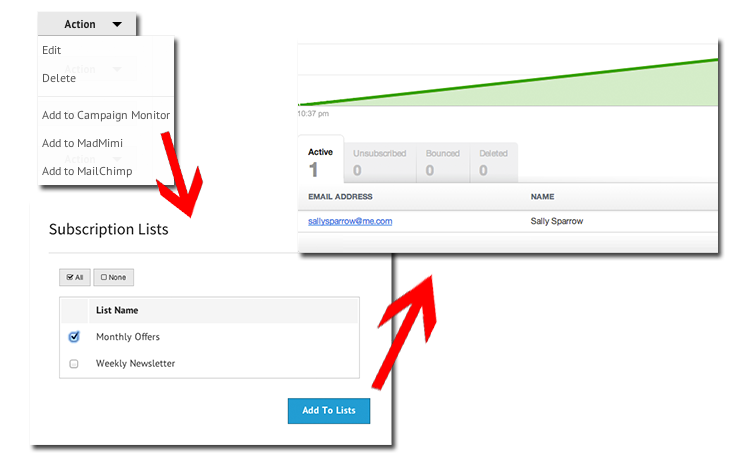 Now, exporting the entire contacts database from our contact manager to a Campaign monitor mailing list is just a mouse click away! Sign up for accounts on both Campaign Monitor and ClinchPad if you don't have them already. Login to ClinchPad and navigate to the contact manager. Follow the instructions in this support article on integrating ClinchPad with Campaign Monitor. You're done. The mailing list is now fresh and complete!